Young Medical Doctors Must End Illegal Strike Now And Resume Work Pro Bono Pubico. & Senior Oxford – Trained Lawyer. Young Medical Doctors in Gambian Public Hospitals, have commenced their so-called “sit-down strike”, after their 48-hour ultimatum they gave to the Honourable Minister Of Health & Social Welfare (Mrs. Saffie Lowe – Ceesay), to resign, ended on Thursday 8th March 2018. On Thursday 8th March 2018, both The Gambia Medical And Dental Association (T.G.M.D.A.) and G.A.R.D. 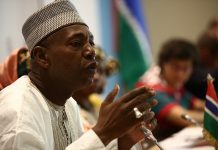 issued a Joint Statement in which they lamented the “lack of responsible leadership, vision and institutional inertia, demonstrated by the Ministry Of Health & Social Welfare…..” and it also divulged a plethora of monumental medical problems, in both The Ministry Of Health and by extension, The Gambia’s entire Health Sector. Admittedly, what the Minister said, was indeed highly defamatory (specifically “slander”) and all of my L.L.B. Undergraduate Law Students at The Faculty Of Law Of The University Of The Gambia (U.T.G.) know this. After a Medical Association mediated between the two parties, The Minister later apologized, to the Young Doctors, for her illegal and provocative utterance concerning them. Once The Minister has apologized, she has automatically retracted her provocative statement. According to The Law Of Tort/Civil Law, as soon as an alleged Tortfeasor (a prospective Defendant) apologizes to the prospective Plaintiff, this can be an effective stumbling block, which will prevent the prospective Plaintiff , from proceeding with a full Civil Case for Defamation, because if he/she proceeds with the Civil Case, after an apology has been given, this may be a legal exercise in futility, because the presiding Judge may end up awarding very little damages, instead of substantial or punitive damages. Firstly, in The Public Service Act, The General Orders Of The Civil Service and The Public Service Regulations, none of these legal instruments, allow Civil Servants/Public Servants to go on a strike Ex debito justitiae (Latin:- out of the obligation of Justice/as of right). Black’s Dictionary (8th Edition) authoritatively defines ‘’an illegal act’’ as “an act that is prohibited by Law”. The word “prohibited” here, can either be expressed or implied. Since the aforesaid legal instruments, do not expressly give Civil Servants/Public Servants, the right to go on a strike, therefore impliedly, as far as those legal instruments are concerned, if Civil Servants/Public Servants go on a strike, this strike is therefore illegal. Expressio unius est exclusion alterius (Latin:- what has been expressly stated by Law, excludes what has not been expressed), a Canon Of Statutory Interpretation. Secondly, the right to go on a strike, which is otherwise called ‘’an industrial action’’ in The Labour Act (2007), is not applicable to Civil Servants. Section 3(2) of the said Act says:- “The Act does not apply to (a) The Civil Service, (b) The Armed Forces, except those employed in a Civil capacity, (c) The National Guard, Police Force, Security Service or The Prisons Service, except those employed in a Civil capacity, (d) Domestic Service, (e) Employment of a member of the employer’s household living in the employer’s house.” “Industrial Action” is defined by Section 3 of the said Act as:- “a concerted withdrawal of labour or restriction on the availability or quantity of labour on the part of workers, or a lockout by which one or more employers deny work to workers.” Even if ‘’an industrial action’’ has been legally instituted, there should be ‘’a cooling off period’’ , for the opposing sides to come to the negotiating table to broker peace and to give diplomacy a chance, pro bono publico (Latin:- for the good of the public). The Young Doctors, should consider doing so now, before it is too late. Thirdly, Section 139(2) of the aforesaid Labour Act says:- ‘’where the taking of Industrial action is likely to affect the continuation of a Service, the interruption of which would endanger the life, personal safety or health of the whole or part of the population, the Commissioner shall be given twenty-eight days notice of the action.’’ If the Young Doctors of G.A.R.D. failed to give the aforesaid Statutory notice to the Commissioner Of Labour, (which may actually be the case), then clearly their so-called Sit-Down Strike is illegal. ‘’He who comes to Equity, must come with clean hands’’, as the famous Equity maxim goes. However since Section 3(2) of the aforesaid Act says, that this Act does not inter alia apply to The Civil Service, then logically speaking, Section 139(2), may only be applicable to workers/employees of Hospitals and Clinics in The Private Sector. Fourthly, all Medical Doctors according to The Law Of Tort/Civil Law, owe their patients ‘’a duty of care’’, which according to The Oxford Dictionary Of Law by Elizabeth A. Martin (M.A.- Oxford), is authoritatively defined as:- ‘’The legal obligation to take reasonable care to avoid causing damage. There is no liability in tort for negligence, unless the act or omission that causes damage is a breach of a duty of care owed to the Plaintiff. There is a duty to take care in most situations in which one can reasonably foresee, that one’s actions may cause physical damage to the person or property of others. The duty is owed to those people likely to be affected by the conduct in question. Thus Doctors have a duty of care to their patients …..’’ A locus classicus (Latin:- best known U.K. Law Of Tort/Civil Law Case for Medical Negligence is, Gillick Vs West Norfork (1986), which was ably decided by The House Of Lords in London. If the on-going sit-down strike of Young Doctors of G.A.R.D., causes a patient to die or causes a patient’s medical condition to be exacerbated or worsen, then either the next of kin or an executor of his/her estate (if the patient dies) or the patient himself/herself (if he/she is still alive), will have locus standi (Latin:- legal standing), to sue those concerned Young Doctors of G.A.R.D., whose illegal strike, directly caused the unfortunate aforesaid state of medical affairs. If the aforesaid Plaintiffs win their Civil Cases in a Court Of Competent Jurisdiction, the Presiding Judge will order the Young Doctors to pay punitive or substantial damages to the winning Plaintiffs, as monetary compensation. The only possible line of defence, which may be available to them is :- novus actus interveniens (Latin:- a break in the chain of causation). This means that, after a person has committed a negligent act, another and more powerful intervening act or thing, was in fact the main cause for the resulting damage, then the person who caused the original negligent act, will be automatically exonerated from any Civil Liability, because of the famous Latin maxim:- de minimis non curat lex (the law does not concern its self with little things. See The Oropesa Case (1943). Fifthly, my legal research at The Single Window Registry in Kanifing, whose able Acting Registrar is, Mr. Alasan Jobe (one of my good former L.L.B. Students at The Faculty Of Law Of The University Of The Gambia-U.T.G. ), revealed that the E-Registry started operations in 2014, and after that the E-Registry made Public Announcements on both Radio and Television, for all those Companies, Partnerships, Businesses and Charitable Associations, which had been registered before 2014, to come and Re-Register so that their details would be in the E-Registry. Therefore all those Corporate entities, which failed woefully to Re-Register on or before the deadlines in the aforesaid Announcements, would be deemed not to be registered, since their details are not in the E-Registry, as it is now the case with G.A.R.D. “Equity aids the vigilant, but not the indolent”, as the Equity maxim goes. The Single Window Registry at The Ministry Of Justice, was Officially opened on 29th July 2015, by the former Vice President Of The Gambia & Minister Of Women’s Affairs (Her Excellency DR. Ajaratou Isatou Njie-Saidy) and I was its Chairman. If the Founder Members of G.A.R.D. wanted to be part and parcel of an Association, which is legally allowed, to go on a strike, then they ought to have registered their Association with Mr. Alieu Jallow, The Acting Registrar General at The Ministry Of Justice, as a Trade Union, under The Labour Act (2007). Trade Unions, are indeed legally allowed to go on a strike, on behalf of workers. This is confirmed, by Section 137 of The Labour Act (2007) which is entitled:- ‘’PICKETING’’. Mr. Alieu Jallow, is also (one of my good former L.L.B. Students at The Faculty Of Law Of The University Of The Gambia-U.T.G.). If in fact G.A.R.D. has not been Officially Registered, as either a Charitable Association or a Trade Union at The Attorney General’s Chambers & Ministry Of Justice, then its Members (both old and young Medical Doctors), can rightly be Charged with the heinous Criminal Offence of “Unlawful Assembly”, contrary to Section 69 of The Gambia’s Criminal Code Act, Cap. 10:01. Sixthly, the so-called Sit-Down Strike of The Young Doctors, is monstrously illegal, because it is diametrically opposed to their Hippocratic Oaths, which in fact make them Practising Medical Doctors/Physicians. I remember a few years ago, during a Graduation Ceremony (at the then R.V.T.H. ), now re-named Edward Francis Small Teaching Hospital (E.F.S.T.H. ), when new Medical Graduates were given their liciences to practise medicine in The Gambia. When DR. Adama Sallah, the then Registrar of The Medical And Dental Council announced:- “I will now called upon the Medical Doctors, to take the Hippocratic Oath”, as the Legal Representative of The Ministry Of Justice, I quickly told him, that was a monumental legal error, because it was after taking the said Oath, that they would legally become Medical Doctors/Physicians. The Hippocratic Oath, is an Oath historically taken by Physicians. It is deeply embedded in Greek Medical Tradition. In Its original form, it requires will-be Physicians/Medical Doctors, to swear by a number of healing Gods, to uphold specific ethical standards. To show that The Hippocratic Oath is sacrosanct and inviolable, in February 2017, a High Court Judge in Kenya, Her Ladyship Madame Justice Hellen Wasilwa, sent some Medical Doctors to jail, for embarking on a Sit-Down Strike, which was considered as a flagrant violation of their Hippocratic Oaths. Moreover, the most famous trials of Physicians of the Nazi era for their atrocities on the minority, were not held on the basis of the existing rules and laws of Germany, but on the basis of them violating their Hippocratic Oaths. Seventhly, the right to go on a strike, must not be confused with “The right to freedom to assemble and demonstrate peaceably and without arms”, protected/guaranteed by Section 25 (1) (d) of The Gambia’s 1997 Constitution. The Young Medical Doctors, are requesting for several reforms in The Gambia’s Health Sector. All of that can be done on a step by step basis, as they continue their bilateral consultations with The Coalition Gambia Government. What is of paramount importance now, is for them to immediately call off their illegal strike and resume work pro bono publico. Their request for the Minister’s resignation or removal by The President, is unreasonable and unacceptable because, it will create a bad precedent, which others will quote in the future and this will be bad Governance. They should learn from their patriotic Senior colleague, DR. Mohammed Kabir Cham, who in 1981 (during the bloody attempted coup d’etat, led by the late Kukoi Samba Sanyang), in response to a radio announcement for Medical Assistance made by Mr. Hassan Njie, after travelling from his Station in Mansa Konko, to bring Medical drugs and first care aid to stranded patients, in The Greater Banjul Area, he was mistakenly shot by Senegalese Soldiers by Abuko, and consequently, his leg was amputated. He really deserves a distinguished National Honour. Next articleWhat with the Shifting Goalposts…?